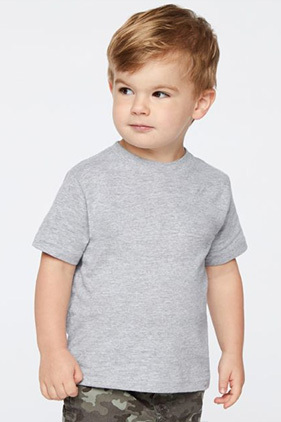 Layered or alone, this t-shirt is soft, yet durable enough to stand up to your toddler's playtime demands. 100% combed ring-spun cotton, 4.5 ounce toddler fine jersey t-shirt. (Ash is 98/2; CVC Colors are 60/40; Heather is 93/7 combed ringspun cotton/polyester). Soft crew neck t-shirt. Topstitched ribbed collar. Shoulder-to-shoulder self-fabric back neck tape. Double needle sleeves and bottom hem. Side seam construction. EasyTear™ label. Ash and White is sewn with 100% cotton thread. CPSIA compliant tracking label in side seam. Toddler Unisex.